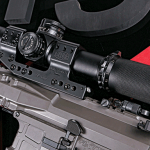 AXTS combined its previous innovations into the MI-T556 and added some new ones, too, to create its version of what an AR-15 could be. All of the MI-T556’s controls are ambidextrous, including the widened bolt paddle, magazine release and Talon safety selector. 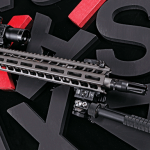 Surrounding the 14.5-inch, match-grade barrel is a proprietary 13.5-inch M-LOK handguard. The MI-T556 comes standard with Knight’s Armament Micro Sights and an ambidextrous Raptor charging handle. The MI-T556’s upper and lower receivers feature both a tight fit and a flawless AXTS Grey Cerakote finish. Made of case-hardened steel, the full-auto bolt carrier is coated in a self-lubricating, polished black nitride finish. 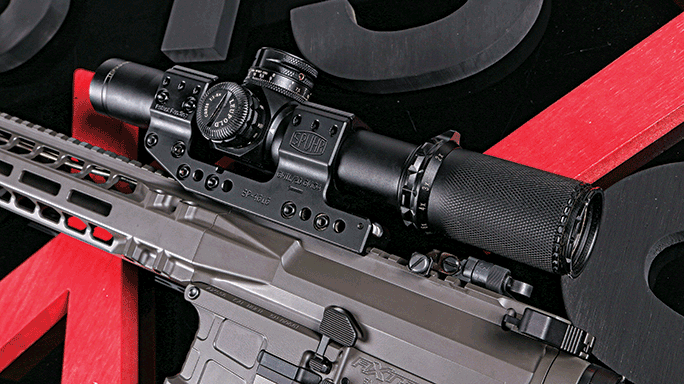 Spuhr’s cantilever mount is made from a single piece of billet aluminum with grooved rings to hold the scope tightly. 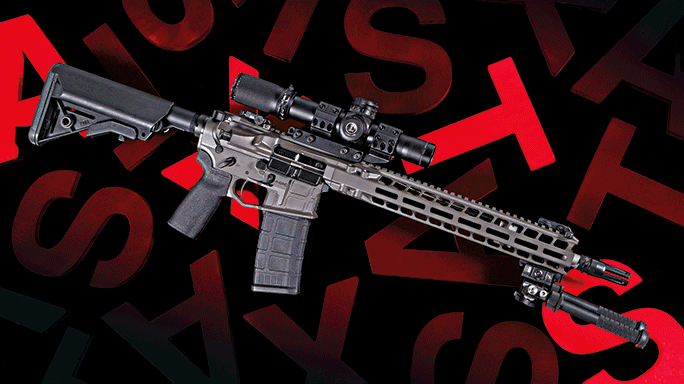 AXTS set out to create a high-performance AR with innovative parts, and the result is a true success. A Melonite-coated Impact Weapons Components QD end plate is fitted at the rear of the receiver. The lower features an oversized, flared mag well and a built-in triggerguard. 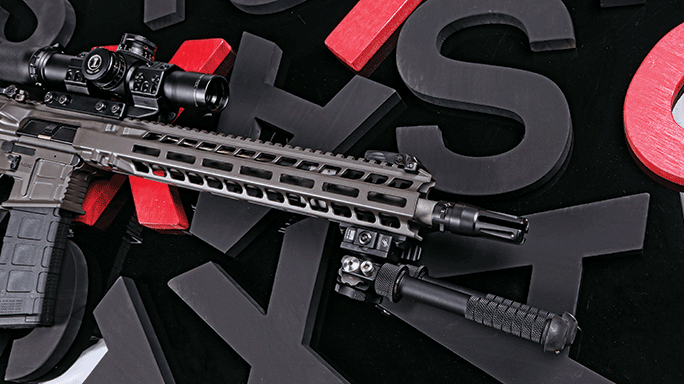 At a time when reducing a carbine’s weight has seemingly become an even more popular pastime than refining it for consistent pinpoint accuracy, AXTS Weapons Systems boldly takes a different approach. 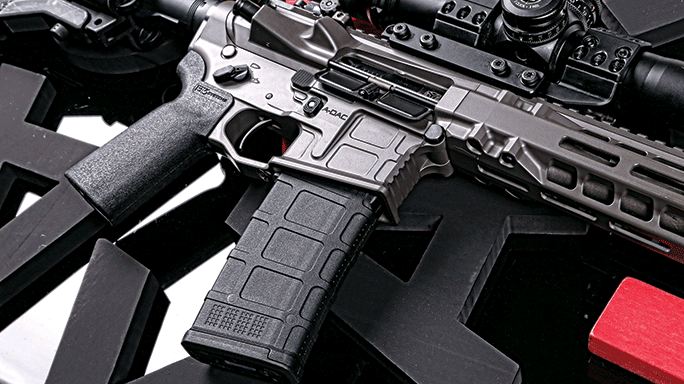 The company’s MI-T556 weighs in at 7 pounds unloaded, which flies in the face of the Paleo diets of many current AR-15s, which are pushing 6 pounds or less—and to our surprise, we love every extra ounce of it. 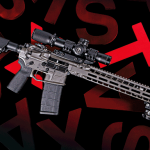 AXTS Weapons Systems is based in Salem, Oregon, and it burst onto the AR-15 scene several years ago by making shooters everywhere do double takes with some very innovative and well-engineered products. 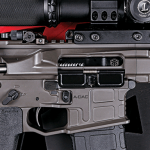 That’s no small task considering all the white noise cluttering an ultra-competitive AR-15 market, but components such as AXTS’ ambidextrous Raptor charging handle and fully ambidextrous AX556 A-DAC lower receivers were perfect examples of purpose-built utility and well-executed refinement. One quick look at the company’s products and you can see that AXTS doesn’t take design, engineering and machine work lightly. 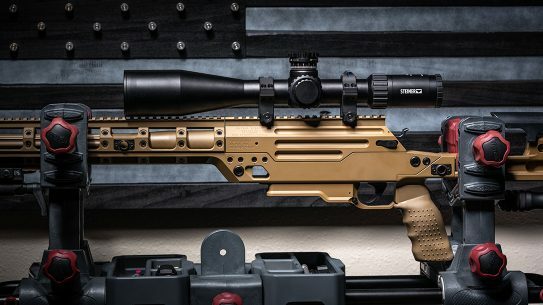 AXTS’ goal with its first complete weapon was to create a full-featured, fully ambidextrous rifle that can outperform others and look good while doing it. 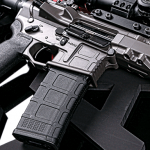 AXTS combined its previous innovations into the MI-T556 and added some new ones, too, to create its version of what an AR-15 could be. Is the end product even better than the sum of its parts? We aimed to find out. The foundation of the MI-T556 is the AX556 A-DAC lower receiver. A-DAC stands for Ambidextrous Dual Action Catch. Let’s examine what that means. 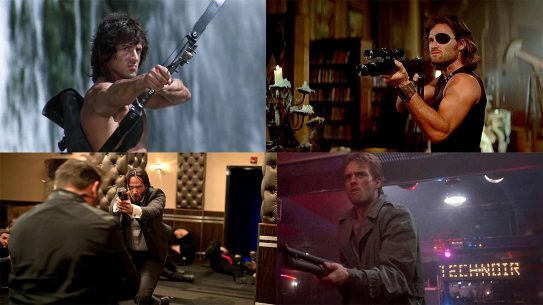 In keeping with the theme of the rifle, the lower is fully ambidextrous. 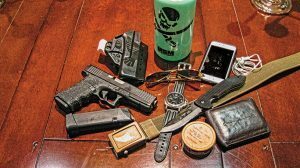 It has magazine releases on both sides as well as AXTS’ convertible 45- to 90-degree Talon ambidextrous safety. 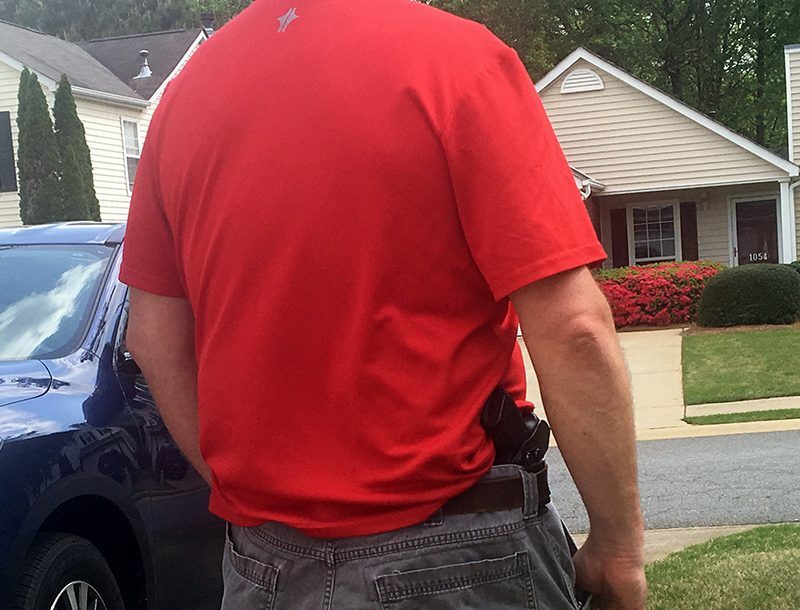 The Talon is unique in that it converts from a traditional 90-degree throw to a trendy 45-degree short throw without removing the safety from the lower. Also, it features a screw-less design, so there’s little chance of it coming loose or falling off. The most exciting ambidextrous features of the A-DAC are its bolt catch and release controls. On the right side, you can hold the bolt back by simply pressing the magazine release button down while racking the bolt back, and release it with the press of a separate bolt release button conveniently located up and to the rear of the magazine release. On the left side, the traditional bolt release paddle has been redesigned to give the left-handed shooter the ability to lock the bolt back with a wide lower paddle and release it with an even wider upper paddle that extends toward the rear. 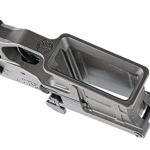 The 7075-T6 billet aluminum lower features noticeably thicker walls and an overall huskier build than your standard forged lower. It contains a buildup of aluminum to help bolster critical areas as well as an oversized, built-in triggerguard. The enlarged and flared mag well features front gripping serrations as well as a waffle pattern on its surface that mimics the look of a Magpul PMAG. Both treatments offer extra traction and add to the MI-T556’s good looks. 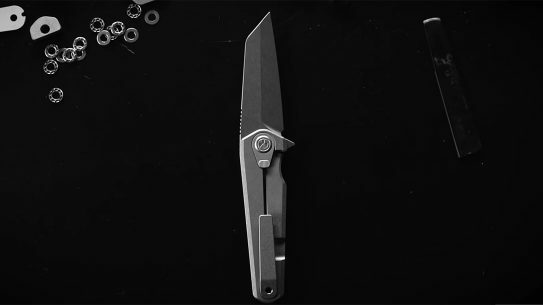 AXTS includes a proprietary anti-rotational hammer pin called the ARHP. It’s the elongated pin just aft of the right-side magazine release button. The ARHP is compatible with any hammer that uses a standard-size pin. Some may not see the need for it, while others will like the extra insurance it provides against wear and tear in the field. The MI-T556’s standard features are anything but. Sitting pretty inside the heart of the lower is a two-stage AR Gold trigger with a consistent pull weight of 3.25 pounds on our Lyman trigger-pull gauge. 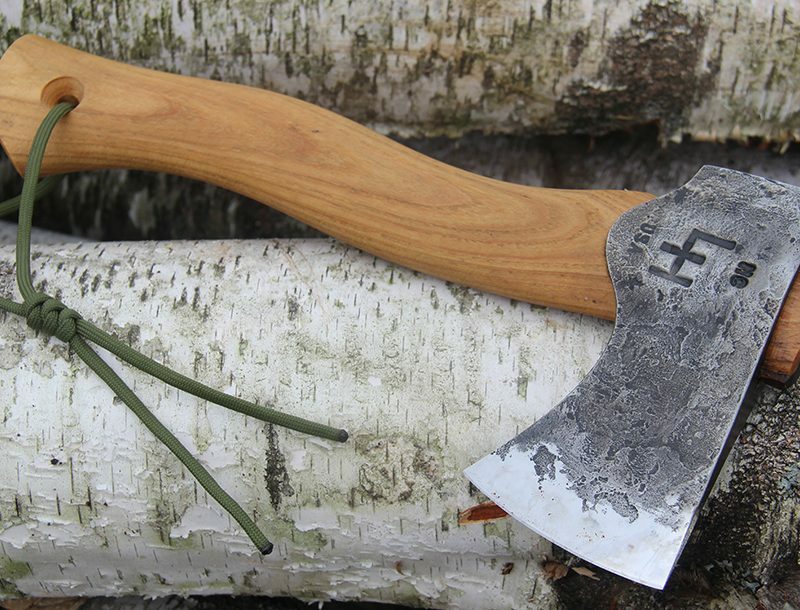 Its feel was ultralight and crisp and had us chomping at the bit to take it out for some live fire. We were delighted to find a couple of our favorites—a B5 Systems pistol grip and an adjustable Enhanced SOPMOD buttstock—rounding out the furniture of this MI-T556 rifle. At the tail end of the receiver is an Impact Weapons Components QD end plate. This sling mount is finished in black Melonite for corrosion resistance and is a secure method of mounting a sling for carrying the rifle. 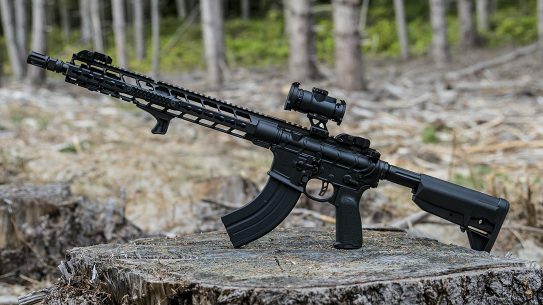 Sitting atop the AX556 is a matched 7075-T6 billet upper receiver with a proprietary 13.5-inch-long M-LOK-compatible handguard. Like its counterpart, the construction of the upper receiver is also thicker than that of a regular forged upper. Both the upper and lower receivers are finished in a durable AXTS Grey Cerakote. 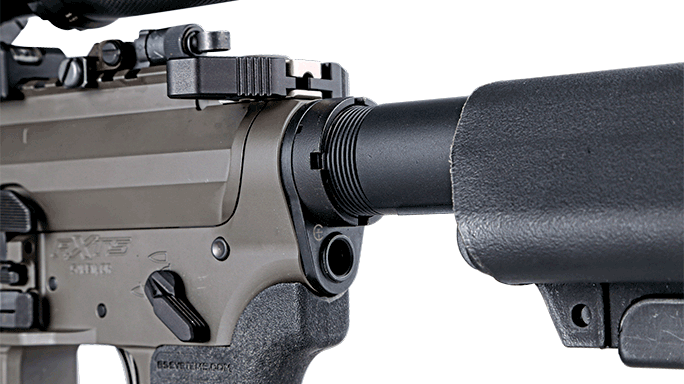 Knight’s Armament Micro Sights come as standard equipment on the upper half. Four vertical bolts help attach the handguard to the upper. 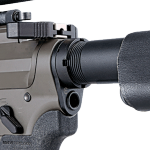 We immediately noticed that the barrel nut, which is designed for quicker heat dissipation, vents heat away from the chamber with slots located at the bottom of the handguard. 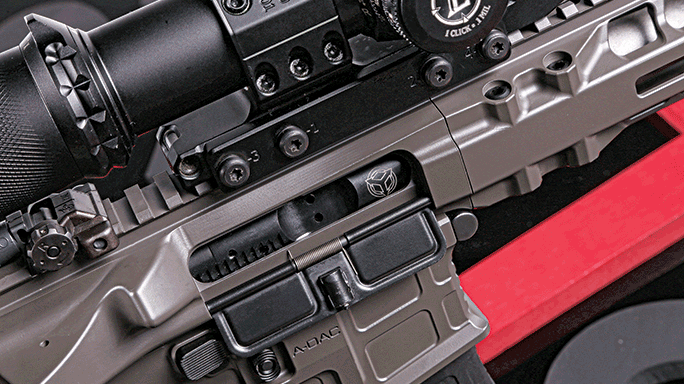 AXTS’ first entry into the ambidextrous-controls movement was the Raptor charging handle. 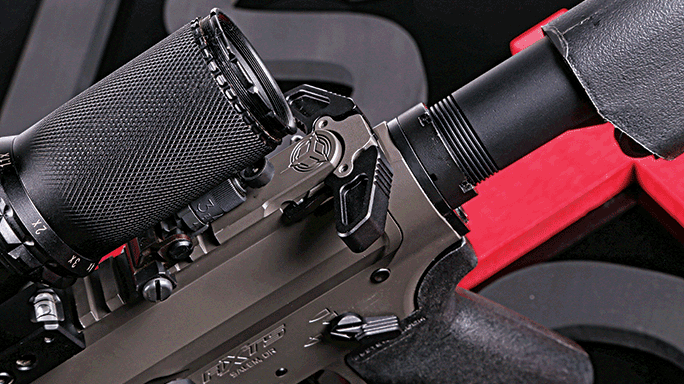 The Raptor is made to allow shooters to rapid palm-blade or finger-thumb charge the rifle from either side. It is made with aircraft-grade 7075-T6 aluminum and features wide, serrated levers. It is only fitting that the Raptor made it into the MI-T556. The Raptor that is included with the MI-T556 is coated in nickel-boron for smooth operation and increased longevity. 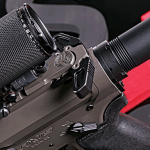 The upper receiver also features a titanium forward assist with a black DLC coating. 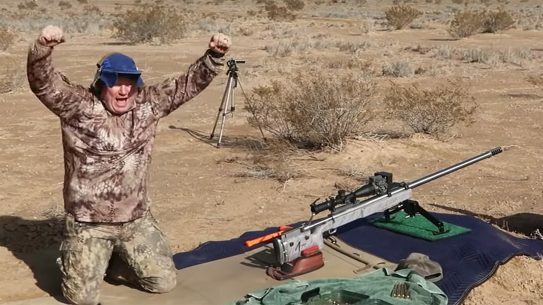 Just what kind of precision can we expect from this rifle? AXTS claims that the MI-T556 will offer sub-MOA performance with 55-, 62-, and 77-grain ammunition. 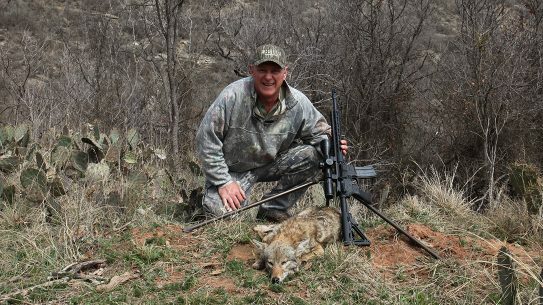 Such accuracy is partly a result of the carbine’s 14.5-inch match-grade barrel, which starts out as a Shilen 416R blank before being turned to a custom profile and given a 1:8-inch twist rate. The barrel uses a mid-length gas system and has a .223 Wylde chamber, meaning it can take .223 Remington or 5.56mm NATO rounds without skipping a beat. The crown is carefully hand-polished, as are the barrel extension’s feed ramps. Our test model was fitted with a superb SilencerCo Saker Trifecta flash suppressor. Customers can choose either the flash hider or muzzle brake version of the Saker Trifecta. Powering this carbine is a full-auto-capable bolt carrier group with a bolt that is manufactured from case-hardened steel. 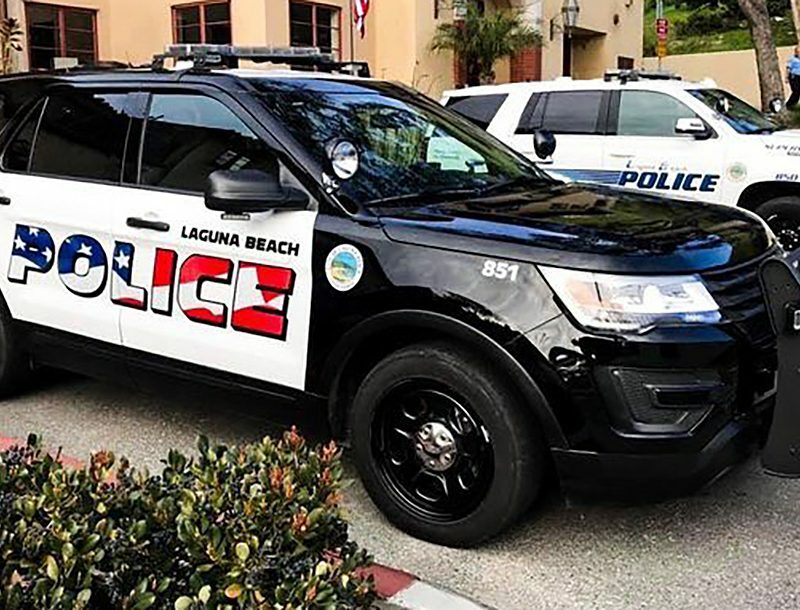 The bolt is also shot-peened, high-pressure (HP) and magnetic-particle (MP) tested for imperfections and coated in a self-lubricating, polished black nitride finish. The bolt lugs are CNC ground to ensure accuracy. 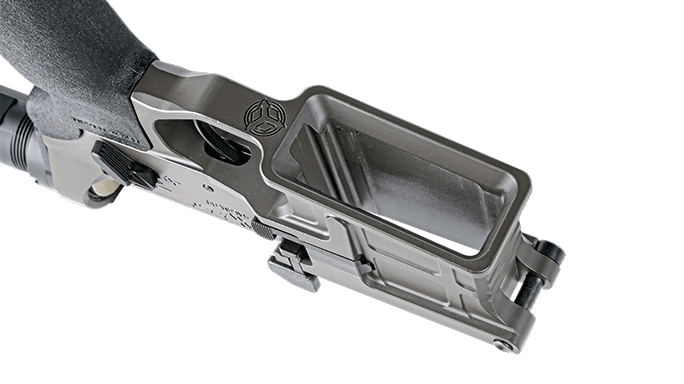 It goes without saying that the bolt carrier’s gas key is properly staked for reliability as well. 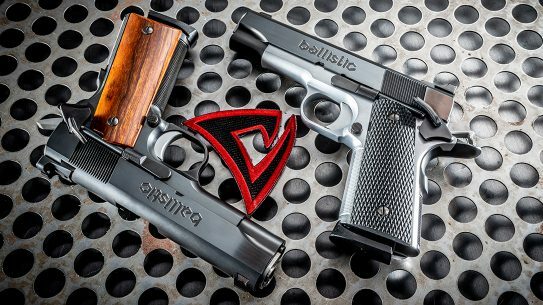 If you’re a regular reader of Ballistic, you’ll notice that we like to outfit the firearms we review with the latest in aftermarket parts. Yes, we enjoy good gear just as you do. But in the case of the MI-T556, we didn’t want to change a thing. 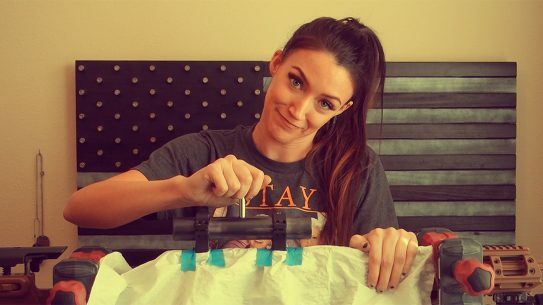 It comes out of the box dressed to the nines. With fully ambidextrous controls, great polymer furniture, a top-notch muzzle device and some of our favorite iron sights, what else could we ask for? Well, the AXTS team answered that question for us. They included a few non-standard accessories with our test MI-T556, such as an Atlas bipod equipped with an ADM 170-S quick-detach mount. The bipod can be adjusted from 4.75 to 9 inches in height, and its legs can shift to four different positions. For sighting, AXTS mounted a Leupold 1.1-8x24mm Mark 8 CQBSS M5B1 scope with a Horus H27D reticle to the rifle via a Spuhr mount. The Mark 8 scope’s front-focal-plane reticle is illuminated, and its 34mm main tube produces a wide range of windage and elevation adjustment travel. Finally it was time to take the MI-T556 to the range for a spin. Our first impression was that this isn’t one of the lightweight AR-15s to which we’re now accustomed. In its bare-bones stock configuration it weighs 7 pounds, which places it in a slightly heavier weight class than others. 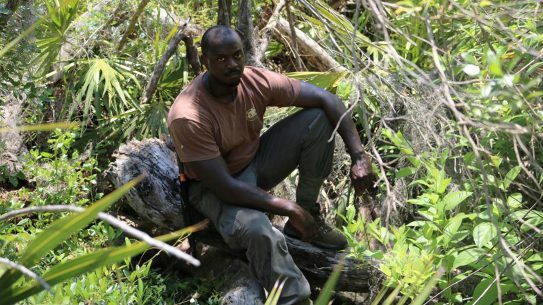 Fully loaded with the heavy-duty bipod and scope mounted, the rifle was pushing 10 pounds. That said, we started with some bench shooting to see what kind of accuracy we could get out of the MI-T556. We’d leave the running and gunning for later. After confirming our zero and getting comfortable with the rifle, we pushed our paper target out to 100 yards. At this point, I’d like to point out that the two-stage AR Gold trigger felt phenomenal. Its reset wasn’t as defined as others that we’ve shot, but the break was delicate and decisive at the same time. Using Black Hills’ 70-grain Hornady GMX ammo, we were able to create 0.8-inch groups on average with our best five-shot group measuring just under 0.6 inches. We’re not precision shooters, mind you, so we’re confident that a competent precision shooter can get into 0.5-inch territory or better. Overall, we felt that the gun was very smooth. Considering that it didn’t have a muzzle brake to help reduce recoil, the buttery smoothness of breaking each shot was a pleasant surprise. The SilencerCo Saker Trifecta flash suppressor did, however, give off a very noticeable tuning fork “ping” after every shot. 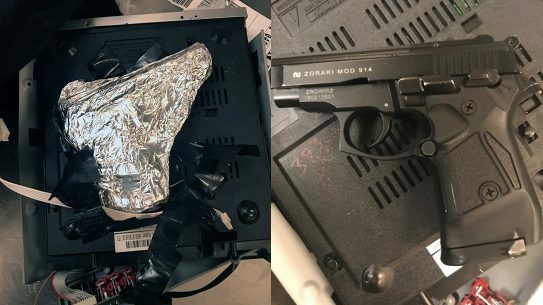 It didn’t bother us, but it might concern some shooters. A suppressor would certainly fix that, but we didn’t have one on hand. After some more plinking at distance, we set up a simple run-and-gun course of fire that included paper and steel targets within 35 yards. 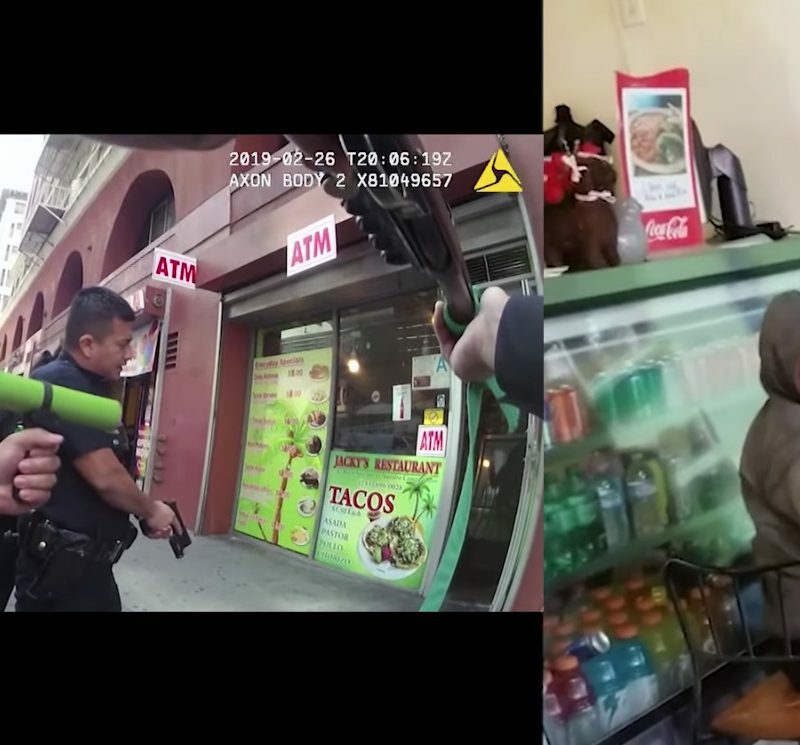 As heavy as we initially thought the rifle was, the issue soon melted away. After taking off the bipod, we felt that the rifle was well balanced and a very stable platform to shoot from when standing and unsupported. Just like when it was being shot on the tabletop, it was smooth and easy to get follow-up shots when standing, too. 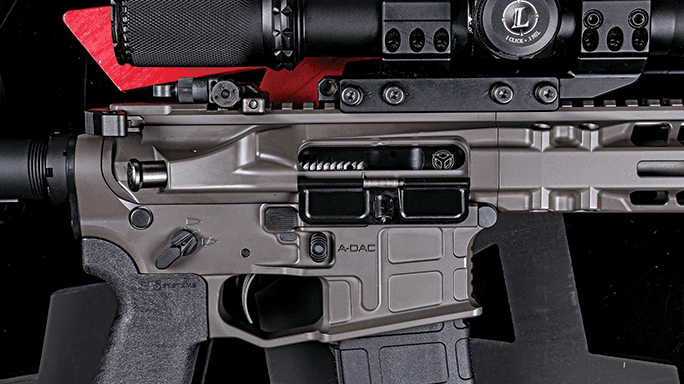 We can’t be sure what makes this rifle so smooth to shoot—perhaps it’s due in part to its weight—but it is also accurate, well-balanced, solid and fun to shoot. The thing feels like a tank in your hands, and we mean that in a positive, rugged way. Again, the trigger was a definite highlight, especially when getting off quick successive shots. In fact, our shots were so quick that a couple of guys from the next berm over came to see if we were firing a select-fire weapon. We didn’t lug it around for hours on end, so if that’s in your plans, you might want to ease the load with a lighter-weight optic setup. But for our simulated competition-style course, the setup you see here was well received. 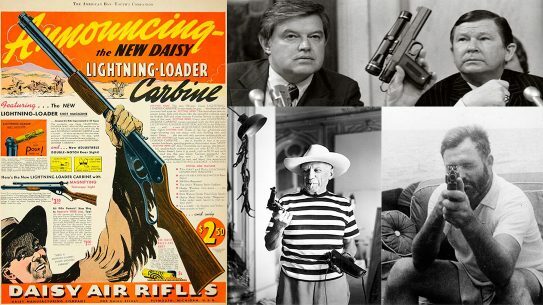 It was during these quick-shooting drills that the ambidextrous nature of the rifle really came into its own. Making ready, doing press checks and the like were all made easier with controls that can be accessed from both sides. We didn’t run into any malfunctions, so we actually had to deliberately create some to see how the controls performed. 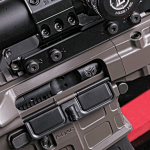 Having the ability to hold the bolt back by pressing the magazine release button may feel strange, but we found that it helped us strip the magazine and simultaneously hold the bolt back to clear chamber-obstructing malfunctions quicker and more easily. It would take some retraining to get used to, however. AXTS Weapons Systems has collected all its innovative designs and combined them in the MI-T556. 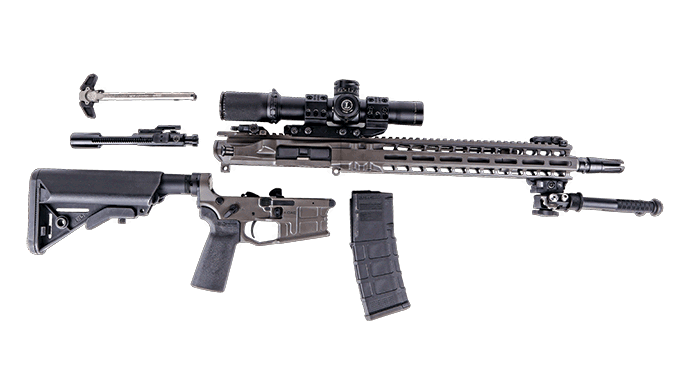 We’d say that the company’s met and even exceeded its goals of producing a truly ambidextrous, high-performance rifle. 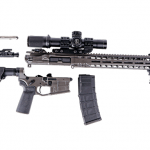 The gun comes complete out of the box with almost every bell and whistle a shooter could want in an AR-15-style rifle, but make no mistake, this is a premium AR that carries a premium price. Available with either a 14.5-inch barrel (as seen here) or a 10.5-inch barrel, the MI-T556 carries a retail price of $2,895. But with such outstanding performance, the MI-T556 is really much greater than the sum of its parts. 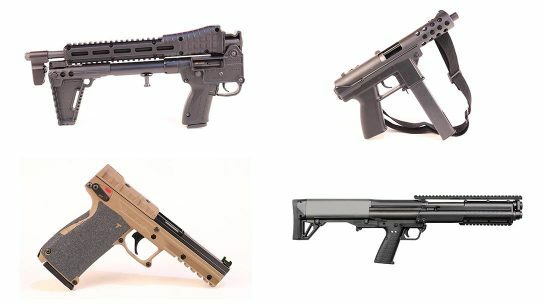 For more information on the MI-T556 and other products from AXTS Weapons Systems, please visit AXTSweapons.com.